In this episode, a boy and his Ekakimon create giant monsters to terrorize the school, then act surprised that anyone would have a problem with this. Aw, we were on such a promising run too. Lately, things have been decidedly tolerable, even going as far back as the peace and serenity of the flying Locomon. We had solid entertainment with ghosts and awkward ship teasing. We had a backstory for Gumdramon that both deepened his character and gave Tagiru a true moment of credibility. We even came really darn close to actual plot development on that island. Even the Phelesmon episode offered some stark visuals that alluded to the gravity of the threat DigiQuartz presented. All of this is starting to build some real momentum to a climax that doesn't feel like we were wasting our time. Then we have this, which shuts all of that down and is certainly a waste of our time. 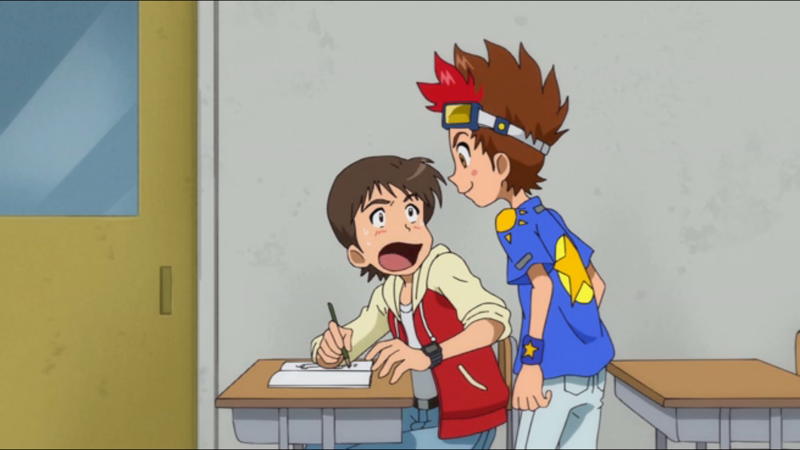 There's nothing offensive or confusing about this episode, where a Digimon who can bring drawings to life teams up with a boy armed with a sketchbook and an overly active imagination. Of course, there's nothing at all in this episode. It's ironic that an episode that is supposed to celebrate imagination and creativity would be completely devoid of both. The pattern is familiar: kid has a problem, kid meets Digimon, Digimon offers solution to problem, hunters try to stop problem, kid helps hunters, Tagiru somehow ends up with a Digimon he probably won't ever use again. Half of Hunters episodes have close to this exact formula, give or take an element. Usually at least one of these comes from a place of sincerity or has an interesting spin. Nothing here is clever. Shouta is pinned as a daydreamer, teased at school because he has his head buried in his sketchbook all day. We could focus on the teasing he gets, but it's not the harshest in the world and at least Tagiru's around to be impressed with everything he sees. The trouble with Shouta is that he should be satisfied with having a creative mind and artistic talent, but he's obsessed with this wish that the things in his head were real. It's fine for a kid his age to want to see UFOs and Bigfoot. It's fine to doodle fantastic plesiosaurs with evolved features; who hasn't designed their own Digimon? But inventing these creatures from scratch and then turning around and lamenting their lack of existence is a bit too detached from reality to make him properly sympathetic. Ekakimon doesn't help matters at all. Maybe he's not the most malicious Digimon out there. Maybe he legitimately enjoys good sketching. Maybe he really does want to cheer up Shouta and make some of his creations real. It's not an excuse for what he and Shouta end up doing. 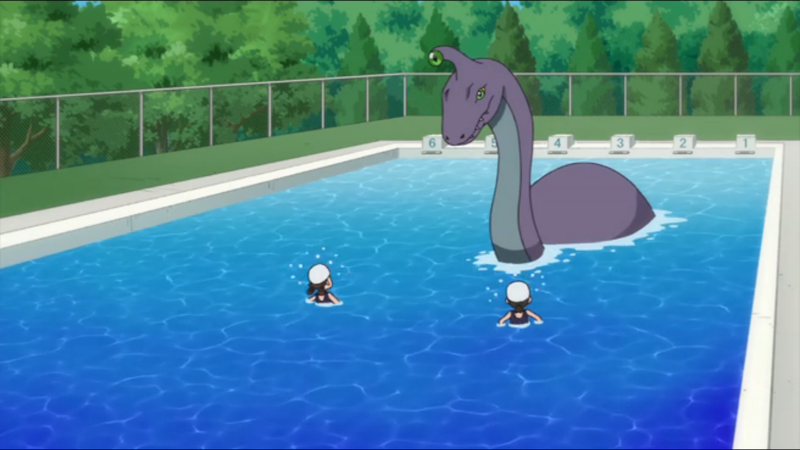 The UFO was a cute little diversion, but as soon as they're dropping our plesiosaur friend in an already-occupied swimming pool, they're going too far. Add in the dragon and the cyclops and this is a proper rampage that needs a proper response. Rather than jumping in guns blazing, the hunters just sort of politely ask them to stop. Shouta and Ekakimon act like they're the ones being attacked, insisting that terrorizing everyone in school is all in the name of good fun. It may as well be another demonic possession as far as the other students are concerned. Yet the episode runs on the assumption that Shouta and Ekakimon aren't all that bad. The hunters never bother to attack Ekakimon directly, going after the creations instead. Once Ekakimon animates the giant chimera of a final boss strong enough to repel the Digimon, all of a sudden Shouta has to be the big hero. It takes a motivational speech from Tagiru to do the trick, but the (rather lame) solution Shouta invents is heralded as the big save. Ekakimon doesn't even put up a fight, going into Tagiru's Xros Loader as an ally rather than an enemy. Given what he and Shouta did, someone really needed to kick their asses. How much of the outside world can Gumdramon actually see from inside the Xros Loader? It's obviously more of a camera than a window, so how detailed is it? Can the other Digimon in there see too? Does anyone spot Tagiru holding it up and ask questions? Later, once Shouta is trying to convince everyone he faked it, who's going to Tagiru to see if he has pictures? Why is there always so much debate over whether a phenomenon is a Digimon? Shouldn't that be their first assumption about everything now? Ekakimon insists that he isn't actually manipulating Shouta. That actually makes what they're doing even worse, since there's no intention of malice... they're sincerely just being dicks. 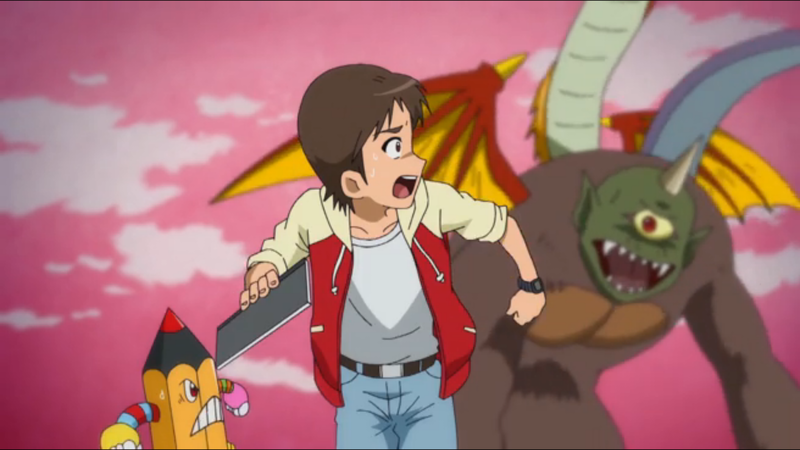 Shouta designs the chimera intending to put in all of the anti-attack elements into it, but the final appearance is no different than any of the others. Is Ekakimon able to bring undrawn intention to life along with the sketch? Wow, it's been an oddly recurring thing in this show that the intended sympathetic one-offs are far from sympathetic. This episode was so frustrating to watch. Quite apart from the gigantic issue of how this supposedly decent kid is dropping monsters onto his schoolmates because he arrogantly assumes that's his right as an artist, it's outright bizarre and nonsensical that he then locks up and can't think of any way of beating something he created, even though he has a nearly godlike power at his disposal. When even a boorish dumbass could have just whipped up a super-duper-ultimate weapon, it's pathetic that the episode devotes several minutes to his sudden crisis of confidence. You have an Ekakimon, kid! Just use it! Even on its own grounds, this episode is extremely stupid. I don't begrudge you the "F".